While the economy has certainly strengthened over the past few years, business spending on capital equipment has lagged. After peaking in 3Q11, the year-over-year growth rate fell for five out of six quarters. There was a slight rise in 2013’s second half; however, the figure retreated in the first quarter of 2014. On Thursday, estimated GDP growth for 2Q14 increased from 4.0% to 4.2%. While the overall adjustment was small, some of the underlying changes were much more significant. In particular, the increase in business investment jumped more than 50% from 5.5% to 8.4%. According to Bloomberg economist Rich Yamarone, the primary drivers in this category included gains in structures spending of 9.4% (previously 5.3%) and business equipment expenditures (up from 7.0% to 10.7%). The figure is also up sharply from the first quarter’s 1.6%. One potential implication is that businesses started putting cash to work more aggressively in Q2. The economic recovery and bull market for stocks is in its sixth year. Many economists and strategists have argued that growth’s next leg would have to be at least partly driven by higher business spending. The catalysts necessary for such spending increasingly look to be in place: The pace of growth is improving and equipment is getting old. According to Federal Reserve Bank of Philadelphia the number of businesses planning to raise spending over the next six months has increased. At the same time, fewer businesses expect to cut spending. If spending is poised to move consistently higher, the increase would be long overdue. US corporate capital equipment is older than at any point since 1965, as the average age of non-residential fixed assets was 15.9 years as of 2012. Before 2005, this figure had been less than 15 years since 1967, bottoming at 13.8 years in 1986. 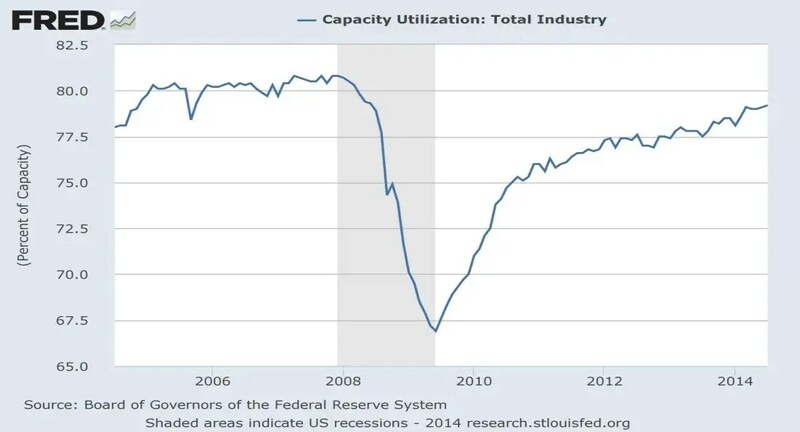 At the same time, capacity utilization, which measures how much output is being generated by the installed capital base, is on the rise. This figure troughed at 66.9% in 2009; in July it was 79.2%. This means that factories and production facilities are moving closer to running full tilt. One possible implication is that capacity will need to be added in the near future. Based on the strength in the equity markets as well as the heightened levels of business and consumer confidence, improved corporate spending is not unexpected. Business investment is a big driver of the demand that fuels the economy. It also plays a critical role in keeping an economy productive over the long term. It is important to note that an increase in capital expenditures is more typically indicative of an economic expansion that is in its latter stages. Against this backdrop we maintain our conservative posture toward the market. We continue to seek well-managed companies we believe are well positioned for long-term gains and are trading for less than their fair value.